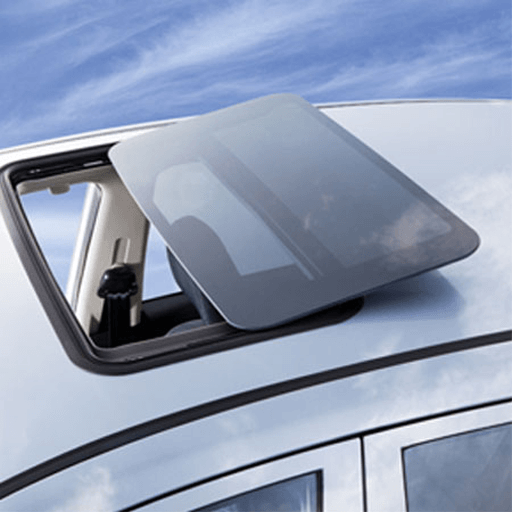 An automotive sun-roof, usually made of tinted glass, is a movable panel that can be opened or closed, fully or partially, and allows light and/or fresh air to enter the vehicle. Cars and trucks with sun-roofs, or moon-roofs, as they are so marketed now, are operated with four separate or combined switches, two that are used to open or close the roof fully, and the other two to open or close the roof partially. Sensing the end positions of the fully open or fully closed state is straightforward and can be accomplished with two Reed Sensors at the end positions with a magnet mounted on the moving roof rail assembly. For the partial control of the roof, a reed sensor and a magnet are mounted permanently within the actuating distance range, and a vane mounted to the roof belt assembly breaks the actuation between the Reed Sensor and magnet assembly for every rotation of the roof motor. The number of rotations taken to open and close the roof fully are known and the number of intermediary pulses received by the microprocessor helps display the exact extent of how much the roof has been opened or closed and also when it will be reaching full closure or full open states. Molded Reed Sensors with highly controlled sputtered coatings, work very well in such pulse counting applications.